How is the Nebrodi Black Pig raised? Averted the extinction danger: the Nebrodi Black Pig populates again our territory. I do not know if you have read information about this breed, but you have to realise that the Nebrodi Black Pig was in danger of extinction. The recovery was very slow and gradual. We worked hard to valorise its meat, and today we can proudly say that we made it. 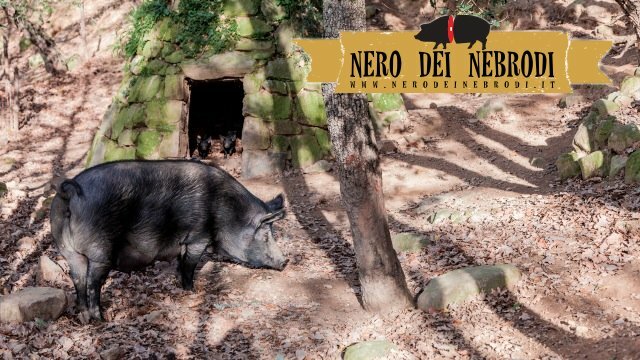 The Nebrodi Black Pig is one among the 43 Slow Food Presidia. We follow two lines: wild and semi-wild breeding. The pigs are raised wildly during all the year: from April to July they live in the woods, but in the time laps between August and September their alimentation is integrated. Heat and scorching heat do not allow the wild breeding (‘en plain air’) during the hottest months. After summer they are freed in the undergrowth. The Nebrodi Black Pig is a smart animal, during winter it is able to find a recovery (zimme). Zimma? Are you wondering how much the territory can influence the product yield? Well, the territory is generally an integral part of the Black Pig. On the Nebrodi chain winters are harsh and long, so the zimme are no more than huts. These are made with stakes which are connected to a circular structure on the base and at the top they are bonded all together realising a cone. They are covered with brooms and ferns. These are ideal for the animals health. Little pigs are never weaned before the 40th day of life. Alimentation is totally due to natural pastures, except in the hottest and harshest months during which pasturages are not enough. Their alimentation is so enriched with cereals and legumes deriving from Sicilian cultivations (barley, oats, corns, chickpeas, chicklings, peas). It is denied every mutilation: tail cut, teeth cut. The only mutilation permitted is the male castration, but only when it is done before they reach their sexual maturity. If little pigs are confined in tight spaces they do not have the possibility to play, so they suffer because they have to limit their curious instinct. You have to think that when the vegetation is scarce, adults dig the ground rooting. The Black Sicilian pig, despite its reduction in size over the last years, still has by comparison to other local Italian pig breeds a certain farming importance. The breed is today farmed with extensive or semi-extensive systems in the Nebrodi mountains, Sicily. years ago was distributed over a larger area, which included the Madonie mountains. The current farming area (800-900 sq km), between “Finale di Pollina” and “Capo Tindari”, is delimited North by the Tirreno sea and South by the Alcantara and Simeto rivers. Valleys, which gradually slope to the coast, characterize these mountains, with a maximum altitude of 1,847 meters above see level. Woods and wide pasturelands cover this region; cork, oak, and beech are the predominant trees. The Black Sicilian pig morphologically presents: black coat, mane, height at whither of 60-65 cm, sometimes wattles from the angle of the jaw, thin and lengthened snout, little ears, short abdomen, long and strong legs with resistant hooves. Animals show high rusticity and disease resistance, are good walkers and grazers, capable to use poor food and to adapt to harsh climate conditions. For these reasons, despite the presence in the area of more productive commercial breeds, we continue to raise the Nebrodi Black Pig.